Imagine sitting down to play a game with no understanding of the pieces or the purpose and lacking the instruction manual. Can you picture the mayhem that might ensue? That is how most people approach marriage. They don't understand their roles, its purpose, and lack the instructions from the one who created it. No Longer Two is fresh take on this old subject. It reveals new insights into how men and women think and behave. 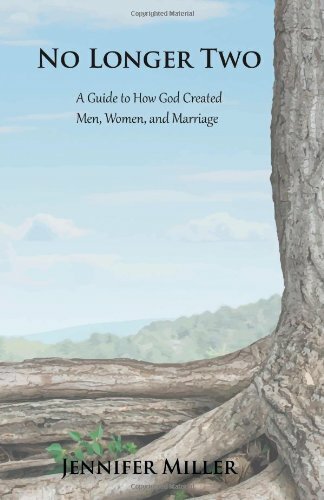 It navigates you toward a stronger marriage by helping you understand the actual purpose of marriage. It also decodes the marriage instruction manual contained within our Bibles; the very one that most people lack, misuse, or misunderstand. This practical resource is easy to understand and fun to read, a definite must-have for any couple. Jennifer Miller is both a Christian pastor and professional counselor who has dedicated her career to helping individuals, couples, and families strengthen their faith and their relationships. No Longer Two is a compilation of all the wisdom she has gained and shared over the years on what truly makes relationships work, as well as how to communicate across the gender gap. In addition to teaching and writing on marriage and family topics, she serves as the Co-Executive Director of a nonprofit Christian ministry, The Center for Living Well, located in Arizona with divisions in Canada and Michigan. To find out more about The Center for Living Well, visit centerforlivingwell.org. Want to bring the No Longer Two experience to your group or organization? Jennifer is available for speaking engagements. Go beyond marriage with this 9-week study that equips you to transform your faith, your marriage, and your abilities as a parent. It is time to revolutionize your home life. Take your experience of No Longer Two deeper or turn it into a small group study with one of our free study guides. No matter your relationship status or stage, you will gain something from reading this book. Choose what works best for you - single, seriously dating or engaged, or married. It's a great read, easy to understand, hard to put down, a life/relationship changer. Don't spend another day in a relationship without it! Jennifer has been gifted with an incredible ability to explain complex topics, Scripture and Biblical meanings in a way that is not only easy to read, but refreshingly easy to understand!